What Are The Best Ways To Build A Rapport With Your Team? As a boss, it’s important to have a good rapport with your team. You need them to want to work for you, to want to do as you ask, but you need to foster an environment that means they don’t walk all over you too. It’s a fine line to balance. There are, however, some tried and tested ways to create a rapport with your team, and still be their boss. A good boss will listen to what their employees have to say. That might be in a meeting, or it could be in general, everyday conversation. Whenever and wherever it occurs, listening to what is being said, and being seen to listen, is essential. 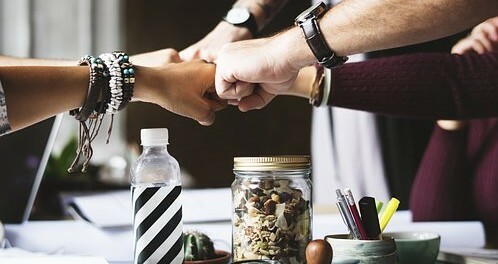 It fosters a feeling of trust and camaraderie between your employees and yourself, and it also means that they will be willing to come to you with any problem they have. Why is this important? If they can tell you about any aspect, good or bad, of their work, it gives you the chance to fix problems and praise hard work (both of which are required if you want to build a rapport with your team). Ensuring that everyone in the workplace has a voice and knows that their opinions will be listened to creates a mindful environment, and people will on the whole be happier. You’ll also find that in group settings people are more keen to speak their opinions, and you can end up with some fantastic new ideas for the company. Part of being a good boss, and one that has a good rapport with the rest of their team, is being able to spot when someone is going through something emotional. It could be a happy thing, or it might be something that is making them upset. Knowing the signs through facial expressions, body language, and even words can make you intuitive. You can ask the right questions and comfort those who need it, and you can determine when someone is pleased with something and help them to celebrate. Paying close attention to your employees shows that you are a caring employer and someone to whom they can go if they have any problems. Understanding how people are feeling isn’t always easy, and it may take some time or even a course in body language and expressions. When you master it, though, it will pay dividends. Praise is one of the best motivators you’ll find in a working environment. It boosts performance and makes people feel good about themselves and the work they’re doing. They will feel acknowledged and useful, and these things will push them to work even harder. Being constantly berated has the opposite effect, and productivity can fall by large amounts. Therefore, even if you need to speak to someone about something negative, always try to begin and end on a positive note. They will be more likely to listen to the message you are trying to give them, and they will also work harder to achieve a better result. Remember, though, to only praise people for something that definitely is praiseworthy. Otherwise, it won’t feel authentic, and it won’t have the desired effect. It’s important to allow your team to blow off steam from time to time, whether that be for an employees birthday, because a target has been met, or due to holidays in the year. Organizing a Boston Escape Room experience, a round of paintball, a cinema trip, or any number of other fun activities not only gets everyone out of the office for a while, but it also lets them get to know one another outside of the confines of their desks and cubicles. This can make them a become a tighter knit team. It also shows them that you are thinking of them and want them to have a good work-life balance. Other ideas include dress down Fridays, free drinks in the office, and an early finish once a week. You might even let your employees have their birthday off work, or consider flexible schedules for those who need it. By making the workplace a fun, enjoyable, easy place to be, you’ll make it better for everyone. It’s important to be a leader throughout any rapport that you are trying to build with your team. It’s good to be well-liked, but you’re not one of the employees – you’re the boss. That means that sometimes you’ll need to be hard on your staff, and dole out reprimands. If you’re too much of a friend to them, that will be much harder (on you and them) than it needs to be. It’s important to lead by example so that they can see you standing up for them, making decisions, and doing what’s best for the company rather than always wanting to make friends. This will foster respect, and although you may not be best buddies with your employees, you will have a special rapport with them. Plus, they’ll want to do as you ask because they know your intentions are good. Setting high expectations may not sound like a good way to build a rapport with your team; it sounds more like telling them that they have to work hard. However, that’s the point. Setting high expectations is indeed about telling your team they have to work hard, but it’s also about encouraging them, and believing that they can do just that. Letting them know that, although what you are asking them to do sounds tough and might be a slog, you know that that can do it, and do it well, makes a lot of difference. They’ll enjoy the feeling that the belief in them gives them, and they’ll want to prove to you that they can do it. These two things combined will give them a positive view of your leadership, and build that much-needed rapport in no time.